Since my boozy haul at Christmas, I've been pretty proud of the fact that whenever guests come to stay I've been more or less able to get them drunk on whatever they fancy. Be it cheap gin, expensive whiskey or decades-old benedictine (no exaggeration), no matter your tipple - I'm your guy. Still, not one to be content with having enough enough alcohol in the house, I knew there was certainly room for one more bottle. Limoncello it is then - the perfect after-dinner drink. Just be careful...this stuff's so damn good that you might be finding excuses to make it an after-lunch drink. I wanted to try something different with this one, so I went with a combination of lemons and limes. Four of each should do the trick. I'm struggling for a name here...limonlimoncello? The beauty of this recipe is in its simplicity. 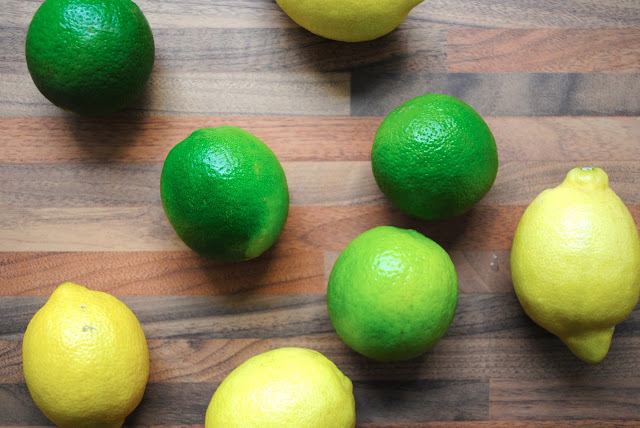 All you need are a few lemons and limes, a sugar syrup and a bottle of vodka. It doesn't even need to be expensive vodka, as you're infusing it over the course of about a fortnight. I mean, don't go buying that cheap stuff that that we used to guzzle down in the park when we were little, but no need to go crazy either. I'm just kidding by the way, I never did that - I was immaculately behaved. Peel all of the zest off your lemons and limes, being careful not to get too much of the bitter white pith. Funny word that, pith. Anyway, this is the only real labour-intensive step in this recipe so not too bad hey? Also by the time you're finished the whole house will smell all lemony-fresh. Throw your peels into a big jar and drown them in the vodka. If you want to reserve a shot for yourself that's your call, I can't stop you and I won't tell you that it's a bad idea. Seal tight and leave for a week, giving the jar a good shake every day. After a week or so, mix in a sugar syrup. Easy to make, just dissolve about 300g of granulated sugar in 500ml of water until it's thickened slightly. Leave to cool before you chuck it in, then seal up the booze and leave for another week. Don't forget the shaking. Can't forget the shaking. After a week simply decant into a bottle and stick in the freezer. And that's a job well done. Pour yourself a large shot in your favourite children's-puzzle-book-character-themed shot glass and sample your, ermmmmm, hard work. Cheers! of course! why, what have you heard?